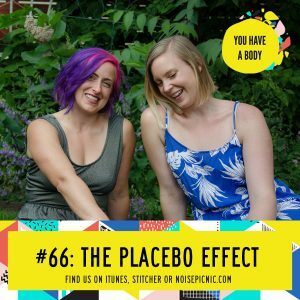 This week on the You Have a Body podcast, Lucia and Hannah give use the goods on the placebo (and nocebo!) effect. How can taking, thinking or being exposed to… nothing… have a substantial, and studied, positive effect on us and our bodies? What does this mean from a pain, nutrition, and fitness perspective? Better listen to find out! Like what you’re hearing? Great! Leave us a review iTunes and we’ll send a personal shout out to you!